We’ve found some delightfully cute things that are bound to make the heart swell and bring some Valentine’s Day spirit into your home! When packing the family off for the day, why not give their lunch boxes a Valentine’s Day themed makeover? I can’t wait to cut my children’s sandwiches into heart shapes using this Heart Shaped Sandwich Cutter ($12.95) while dressing up their usual muffin with Robert Gordon’s Baked With Love cupcake kit ($10). I am positive my teenage son will appreciate me thinking of him on Valentine’s Day when he reaches for his lunch! 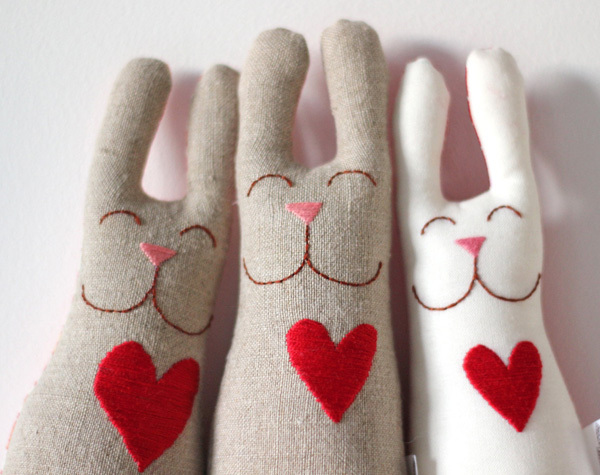 For Valentine’s Day themed gifts for little people, it’s easy to go a little crazy – I could fill a whole warren with the cheeky plush Valentine’s Bunnies from The Fox In The Attic (priced £14 each and pictured right at the very top). 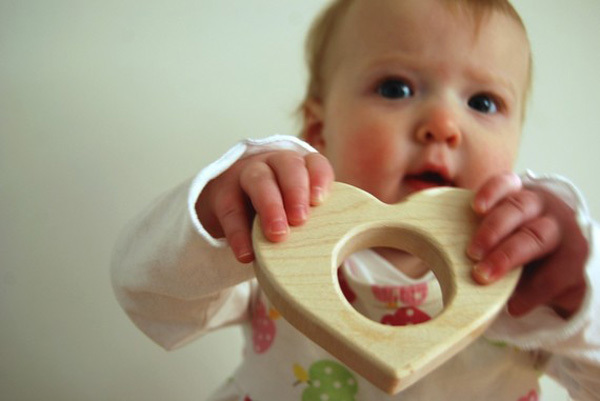 A practical gift is a Little Sapling Toys Heart Shaped Teether toy, priced $17.50 from Sukimama. 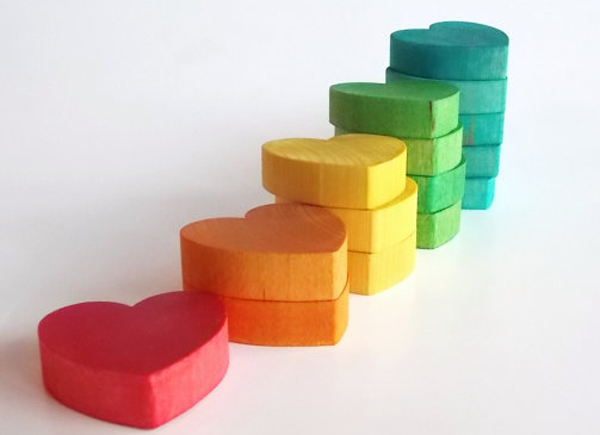 Children of all ages will love these rainbow coloured Counting Hearts, (priced US$25). With fifteen hearts, each measuring five centimetres wide, this is one block set that’s full of heart! 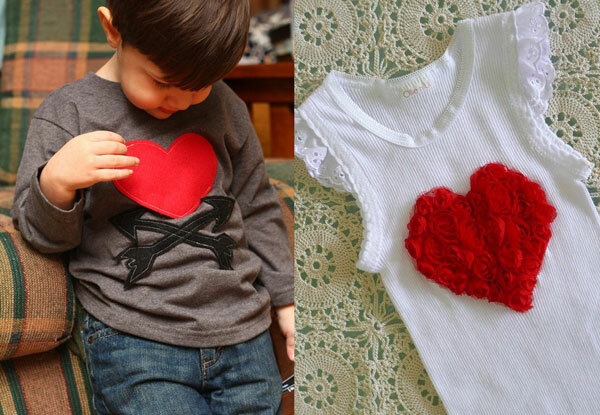 The Australian summer season has been unpredictable to date, with sweltering heat followed by much, much cooler days – so I’ve rustled up a couple of options for cute Valentine’s Day tees. This sublime long sleeved Heart and Arrows tee from We Three Bees (US$25) is a fab unisex option with its huge bold red felt heart and black arrows. Of course, if it looks like it’s going to be hot, I love this dainty white singlet with delightful rosette filled heart and ruffle sleeves. An absolute steal at $16 (and only an extra $2 for postage!) this singlet is available in sizes one to eight from Ollie ‘n’ Lil. 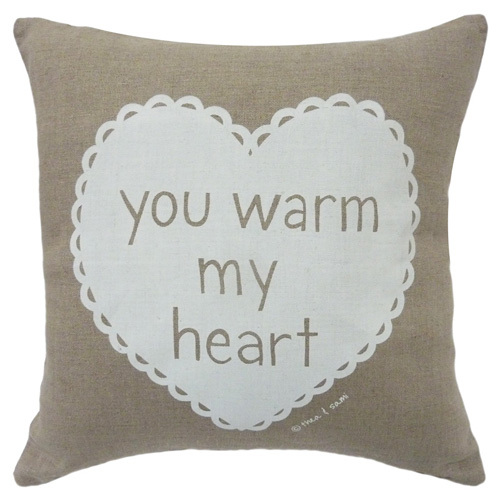 Personally, I love to shop for homewares, so I’ve been quick to pick out a few Valentine’s Day favourites, such as this cushy little Warm Heart cushion, a perfect addition to a nursery chair. 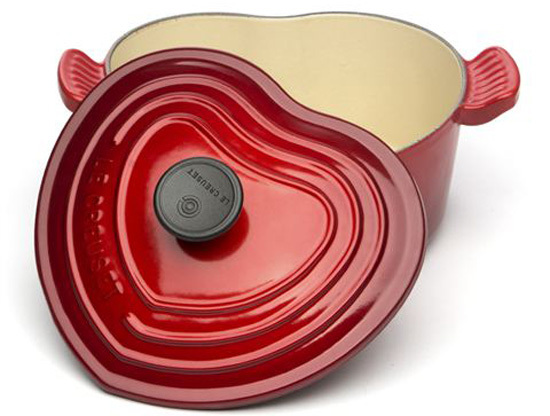 It wouldn’t be Valentine’s Day without preparing a special family dinner and I can only dream of cooking up a little something in a Le Creuset Heart Shaped Casserole Pot, priced $219 from Peter’s Of Kensington. 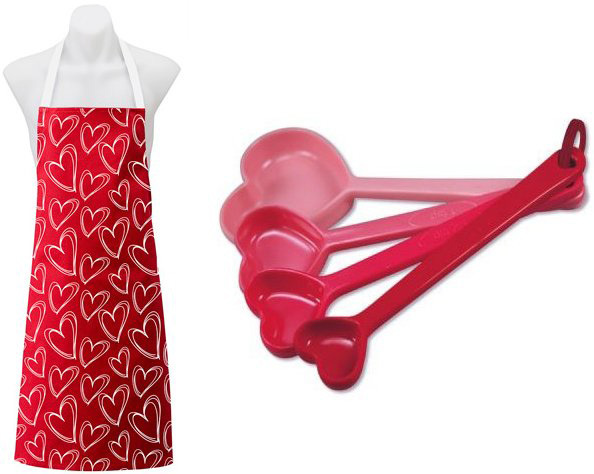 Of course to concoct such a hearty dish I’ll need a set of uber cute Love Heart Measuring Spoons ($9.95 from Lark) and a new heart covered Alperstein Red Heart apron – $14 at Peter’s Of Kensington. 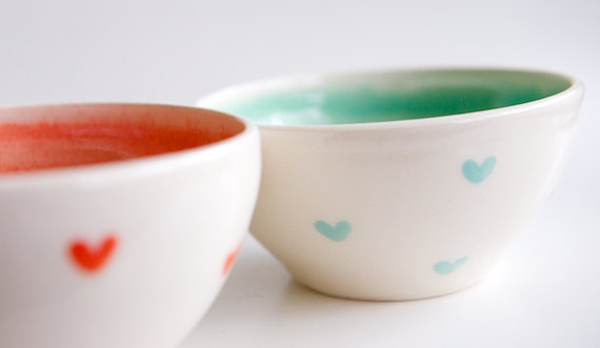 How lovely it would be to start the day with breakfast cereal served in these cute ceramic bowls from Etsy’s RossLab. Beautifully handmade with bold colour inside and the cutest sprinkling of teeny hearts on the outer. These coral and teal bowls are made to order and are priced US$56 from RossLab. Finally, for a burst of colour I can’t see past these gorgeous prints from Melbourne based company, Happee Monkee – it’s those Scrabble tiles that get me! 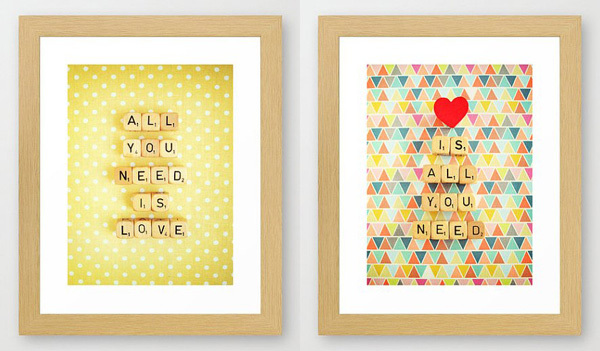 Matching A4 sized art prints All You Need Is Love and Love Is All You Need are priced $35 a piece from Happee Monkey.